Stomper Lum wants you to join him in keeping fit. This active 65-year-old junior college physics teacher keeps healthy by engaging in different types of physical activity, with various groups he has joined over the years. The Stomper takes part in an average of seven group activities per week, which include running, walking, stretching and dancing. He told Stomp: "There are sessions that are carried out throughout the week. On some days I go for two sessions in one day." Yesterday (Dec 6), Mr Lum went to West Coast Park for a 7.7km walk with a group of senior citizens. He said that this group walks long distances twice a week, around different parts of Singapore. 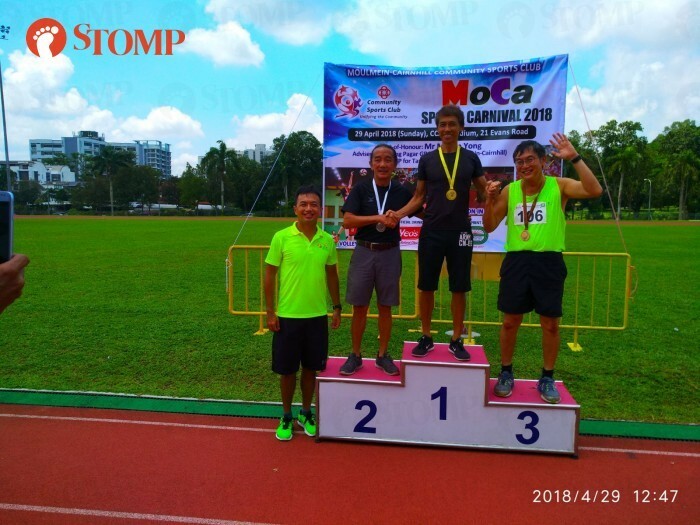 Mr Lum also joined amateur running group Singapore Masters Track and Field (SMFTA) after reading an article about runners from the group two years ago. He said that the group trains three times a week in the evenings on Tuesdays, Thursdays and Sundays, at stadiums in Simei, Kallang and Bishan. According to Mr Lum, the group's coach is Mr Philip Lee, who was once the coach for Singapore's national hurdling team. Another one of the activities he takes part in is group stretching. He does this on Sundays from 9am to 10am at Heartbeat@Bedok, outside Watsons pharmacy. This is a picture that he snapped while at a session on Nov 18. When asked why he joined many groups, Mr Lum said: "I think that it is important to keep fit, but sometimes doing so alone is tiring. "You have to motivate yourself and rely on your own willpower which can be hard. "I joined the groups as I can make friends and exercise at the same time. "There is camaraderie built through groups like this, which encourages me to attend the sessions." Mr Lum also says that he wants to take responsibility for his own health. "My children are very happy that I am exercising and keeping active. "I know that it lessens their burden in the future, as they don't have to invest a lot of time taking care of my health. Mr Lum thinks that each individual should try and take ownership of their own health in any way they can. "I sent the pictures to Stomp to encourage people, young and old, to just keep moving. "My wife is a part of two groups that carry out activities such as walking and stretching. These are activities that are simple. "The ageing population in Singapore is a serious issue and we need to start trying to take care of ourselves."